The nature on the banks of Aha Dam is amazingly lush, and one almost could imagine m/s African Queen with Humphrey Bogart himself at the tiller to sail from the shadows of a creek entering the dam. Northern Okinawa’s Kuni-gami Village is fired up about its Saturday Aha Dam ‘Kuina’ Festival, and can hardly wait to showcase the unique nature opportunities to visitors. Yanbaru Discovery Forest in Kunigami Village and the area around Aha Dam will hold a workshop festival ‘Aha Dam ‘Kuina’ Festival’ Saturday from 10 a.m. ~ 5 p.m. Yanbaru Discovery Forest was created in 2007 on the site formerly Aha US military training area, with surrounding rich natural forest made up by typical plant systems mixing with northern and southern plants. 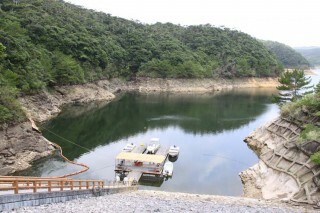 The boat pier is the starting point. Yanbaru is widely known as a habitat of Yanbaru inherent animals like ‘Yanbaru Kuina’ which is also called the Okinawa rail, ‘Noguchigera’,Pryer’s woodpecker, and ‘Yanbaru tenaga kogane’, Cheirotonus jamper. In such a unique place, people can enjoy a variety of workshops, as well as an Aha Dam facility tour that people are usually not allowed to enter, a dam pleasure trip and a paid woodworking production experience. Yanbaru Discovery Forest will provide jungle canoe experiences and forest guide walks, with advanced reservations required. The entire family can enjoy it, and kids especially will like it! You really don’t have any experience like this in a city! Hands-on woodworking experience is something most of the kids visiting Aha Dam haven’s had a chance to experience. Admission to the festival itself is free at Aha Dam and Yanbaru Discovery Forest in Kunigami Village, but there are fees being charged for some activities, and some require reservations. 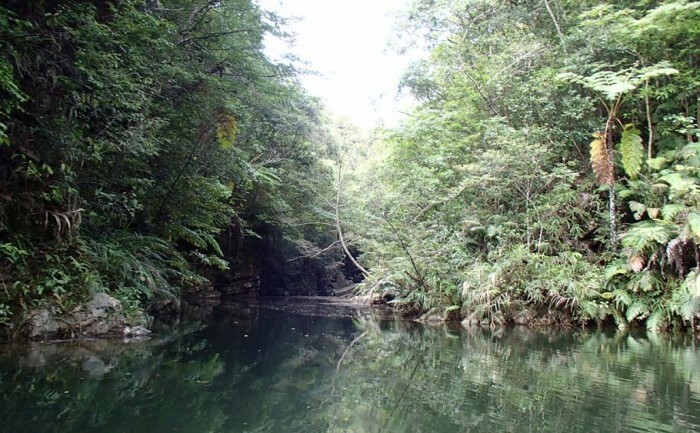 The Jungle Canoe Experience is ¥3,000 for adults, ¥2,000 for children. The forest guide walks are ¥1,000 for adults and ¥500 for children. Call 0980-41-7979 for reservations. The forest therapy experience for adults is ¥2,500. Call 0980-41-2122 for reservations. Aha Dam facility tours and Aha Dam pleasure trips are free but participants need to sign-up on Saturday between 9:00~15:00, first-come basis. The Aha Dam pleasure trip is scheduled for 28 times, 10:15 a.m. ~4:20 p.m., about 4 adults a time. The Aha Dam facility tour is scheduled to 10 times, 10:15 a. ~4:00 p.m., about 6 adults a time. Organizers will also conduct workshops in making chopsticks and ‘Kuina’ wooden key holders. The cost is ¥500 per class, per person. 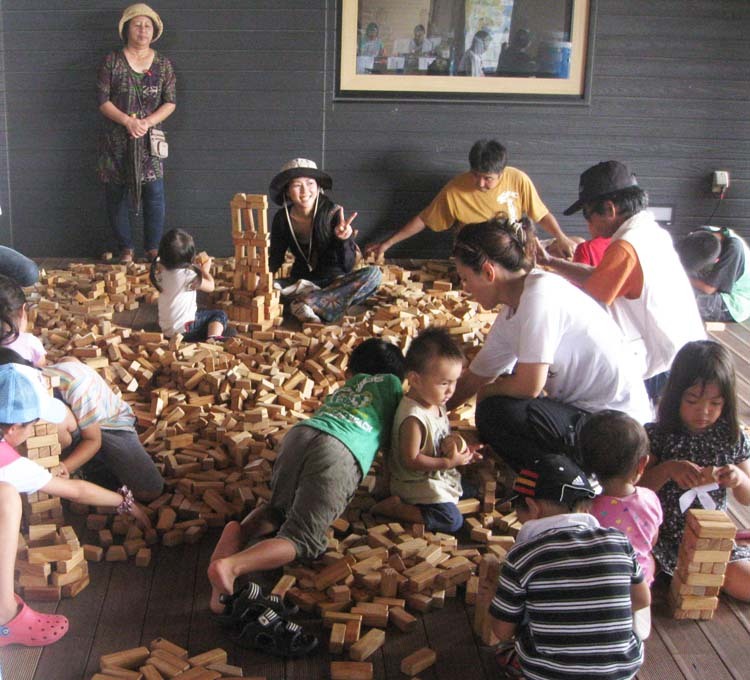 For ¥1,000 per person, visitors can learn to make a wooden jigsaw puzzle.